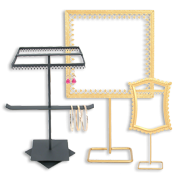 Showcase your jewelry collection with our stylish metal displays and remodel your store's look! Shop our huge selection of metal stands, counter tops, racks, boards & tree displays, all at discount prices thanks to our wholesale deals. Available for every type of jewelry: from earrings, chains & necklaces to rings & bracelets and more.